Last week, I discussed how the bears wasted an overbought reading, with the market going sideways. It now seems that in the past week the bulls have wasted an oversold reading. 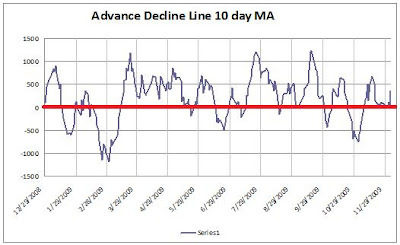 After today's session, the 10 day moving average of the NYSE Advance-Decline line will favor the bears. The 30 day moving average will favor the bulls for another week. Conclusion: For today's session this indicator gives the bulls a small advantage. Starting tomorrow the small advantage goes to the bears. The low number of bears in the Investors Intelligence poll is at an extreme that has rarely been reached. In the past this type of reading has led to poor performance. However, other sentiment measures are not as extreme. The AAII survey, RYDEX data and put/call data are not nearly as extreme. Anecdotally, it does not seem that sentiment is as giddy as the II poll suggests. I speak to more people on Main Street than on Wall Street so that might be why I'm not seeing extreme sentiment. Conclusion: The bears have a small advantage. The advantage is clearly the bulls but the bears do have an opening between now and Christmas where seasonality is not as strong. The bulls have a slight advantage with momentum slowing. The risk trade is showing some fatigue with gold and momentum stocks like Apple struggling, while the dollar is trying to rally. Conclusion: Advantage bulls but momentum can turn on a dime and we might be seeing a reversal in the risk trade with gold trading lower again. There is a heavy IPO calendar this week. In addition, the government is set to auction off JP Morgan Chase TARP warrants. It is also possible we will see banks follow in Bank of America's footsteps and issue equity. Issuance will be on the heavy side while we have not seen many cash takeovers. Conclusion: The bears have a strong advantage following the Bank of America equity raise. Normalized earnings (Schiller or Hussman method) point to a market that is overvalued by over 25%. We are seeing one of the weakest recoveries in post war history. Were it not for the largest stimulus package ever the recovery would be even weaker. In the short run fundamentals and valuation matter the least of any metrics. Good list. Gold is very important here. It is a barometer of risk taking by investors, if it struggles to regain last week's highs, I don't think stocks can make progress. It seems like its all one big risk trade, and dollar weakness seems to be the lynchpin. Im thinking that at some point Gold bounces because its falling too fast. That might lead to a knee jerk rally in stocks and might be the best short term entry point for short positions.